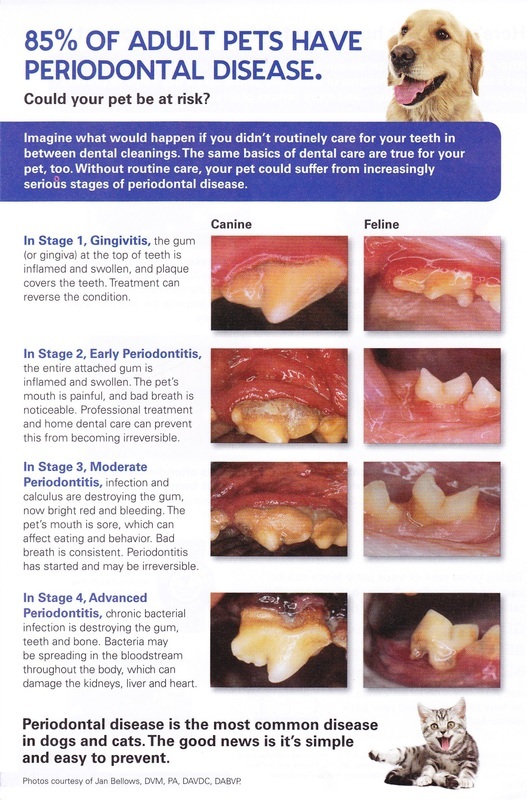 More than 85% of dogs and cats older than four years have periodontal disease. Periodontal disease starts with the formation of plaque, a transparent, adhesive fluid composed of bacteria. Plaque starts forming within eight hours after a thorough dental cleaning. When plaque is not removed, mineral salts, in the saliva, precipitate forming hard calculus. Calculus is irritating to gingival tissue. By-products of the bacteria "eat away" the tooth's support structures eventually causing pain and periodontal disease. Another clue that your pet may be in pain is if it goes to the food bowl and backs away as if scared or drops food from its mouth.